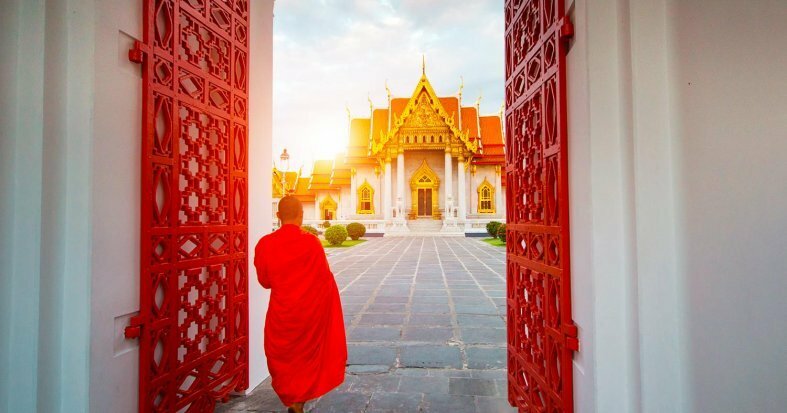 Be amazed by eye-opening Bangkok and experience the bustling city of Hanoi, the mystic waters of the stretching Mekong Delta, the wonders to be found in Hue and the historic capital Ho Chi Minh. 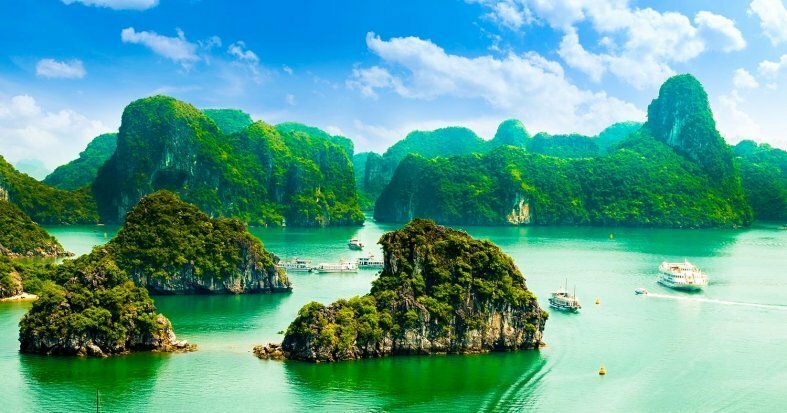 Enjoy an overnight river cruise in Halong Bay and discover the secrets of the Ben Tre river. 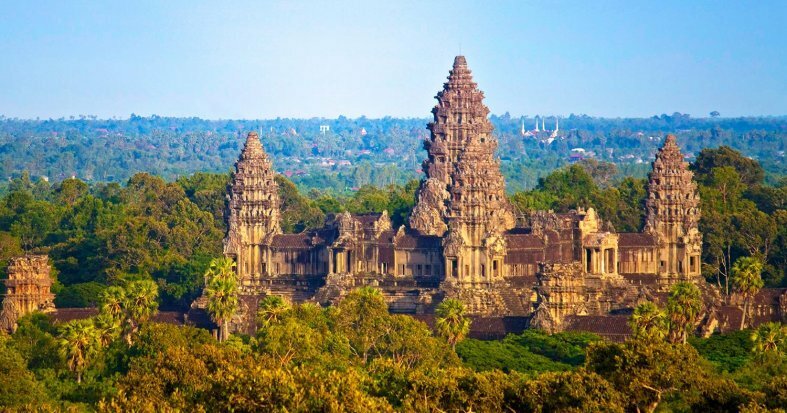 In Cambodia, explore the legendary temples of Angkor Wat, an awe-inspiring UNESCO World Heritage site. International flights: UK - Bangkok, Ho Chi Minh - UK. 14 Breakfasts, 1 brunch, 1 lunch and 1 dinner. Bottled mineral water and wet wipe in the car during the tour in Vietnam. If your destination is in the USA or Canada, or if your selected flights to a different destination have connections in the USA or Canada, it is mandatory to have an ESTA (for USA) or an eTA (for Canada) before travelling. * Details of your internal flights will be detailed in your travel documentation, in your Private Area, nearer to your departure date. Please note: All internal flights are operated by Vietnam Airlines except for departures on the 25/02/19, 06/05/19 and 10/06/19 where the internal flights are with VietJet. 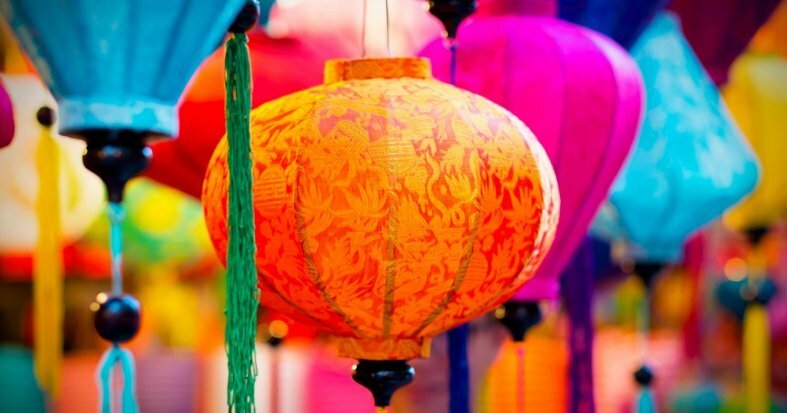 ** From April onwards the Lantern Hotel in Hoi An will be closed for renovation. Your hotel in Hoi An will be Le Pavilion instead. *** Possibility of booking optional excursions in the next step of the booking. Please note that all additional optional excursions which are not selected at time of booking must be requested before final payment is made at least 60 days before departure. It is essential to fill in the passport information correctly for each passenger in the given boxes at the end of the reservations process. Drinks, tips and any other services not mentioned in what's included. Arrival at UK departure airport ready to check-in for an overnight flight to Bangkok. Arrive in the capital of Thailand and transfer to your hotel. 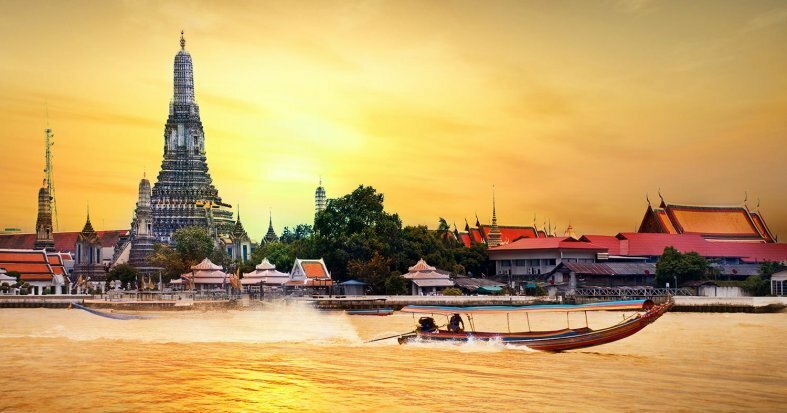 Bangkok is one of the most influential, modern and lively cities in Southeast Asia due to it's economic, political and social development. Make the most of your time in the city by exploring the bustling street markets or enjoying some of the exotic street food on offer. Overnight in Bangkok. Breakfast at the hotel. 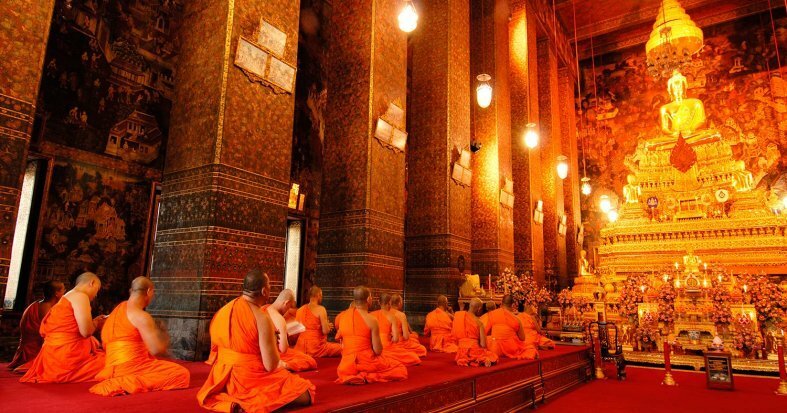 Today, enjoy time at your leisure to explore the different neighbourhoods or Bangkok and to do some sightseeing. 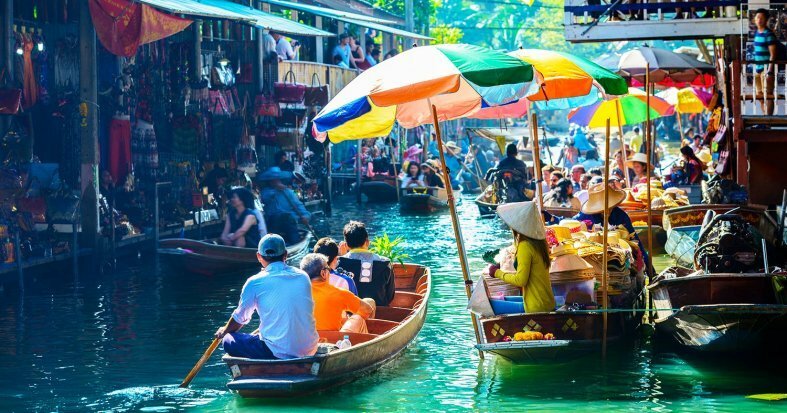 We recommend visiting the Floating Market to experience authentic Thai culture. Overnight in Bangkok. Breakfast at the hotel. Spend the day at leisure. 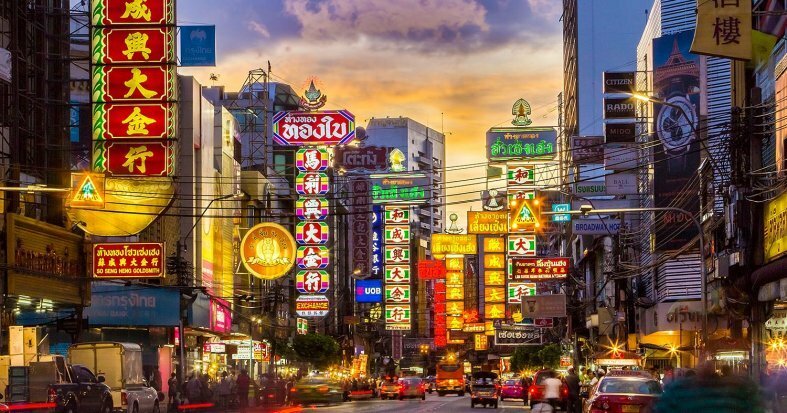 We recommend a bicycle tour of the real Bangkok where you can explore Chinatown's narrow lanes and markets for a taste of the liveliest sides of Bangkok. Or visit the many beautiful temples dotted around the city. Overnight in Bangkok. Breakfast at the hotel. Transfer to the airport for your flight to Siem Reap. Arrival in Siem Reap. Meet your guide and transfer to your hotel. Take the opportunity to explore this beautiful city and get to know your surroundings. Discover the exotic local cuisine and relax at your hotel. Overnight stay in Siem Reap. Breakfast at the hotel. Today explore the most significant temples in the Angkor Complex. 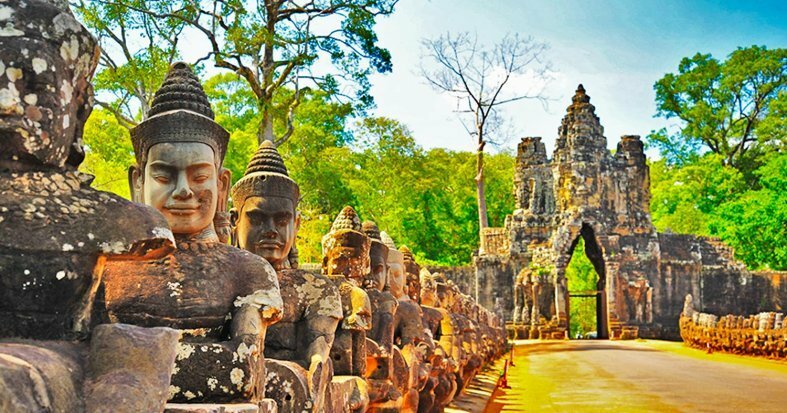 Visit the ancient capital, Angkor Thom and enjoy the unique decorative towers of the Bayon Temple. 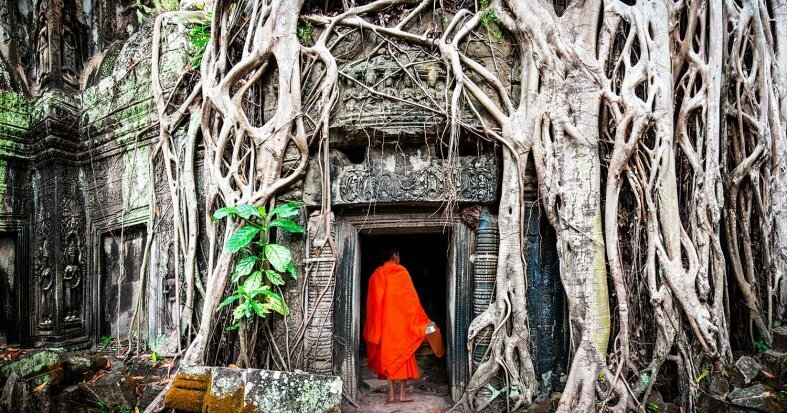 At Preah Khan Temple, wonder at the 12th-century splendour before you continue to Ta Prohm in the afternoon, home to the enormous iconic fig tree roots that grow through the middle of the temple. Admire Bayon architecture at Banteay Kdei temple before you finally arrive at Angkor Wat, the world heritage site and most revered of all the Cambodian temples. It features the longest bas-relief in the world and is the perfect place to watch the sunset over the entire temple complex. Overnight stay in Siem Reap. Breakfast at the hotel. 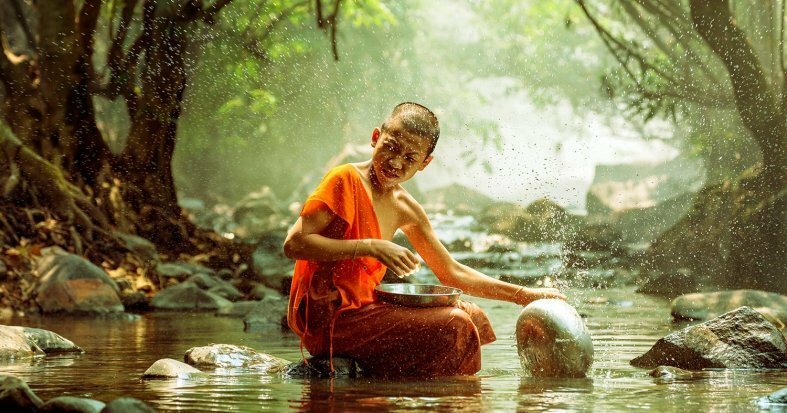 Enjoy a day at your leisure to explore the ancient city of Siem Reap. Overnight stay in Siem Reap. Breakfast at the hotel. The day is free at your leisure until being transferred to the airport for your departure flight to Hanoi. 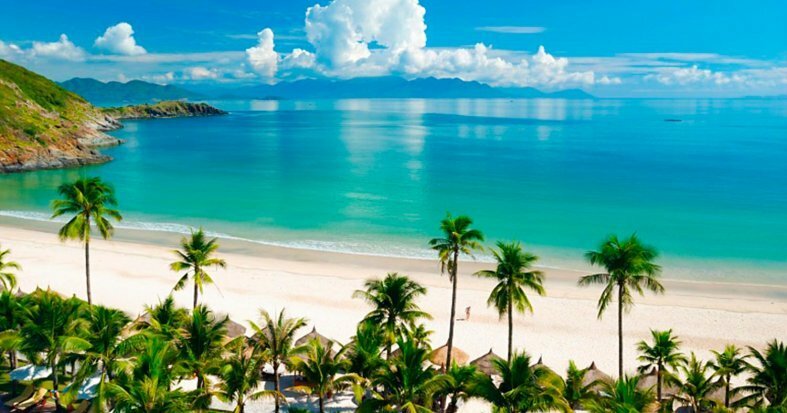 Arrive in Vietnam and transfer to your hotel. Take the opportunity to explore this bustling city and get to know your surroundings. Overnight stay in Hanoi. Breakfast at the hotel. 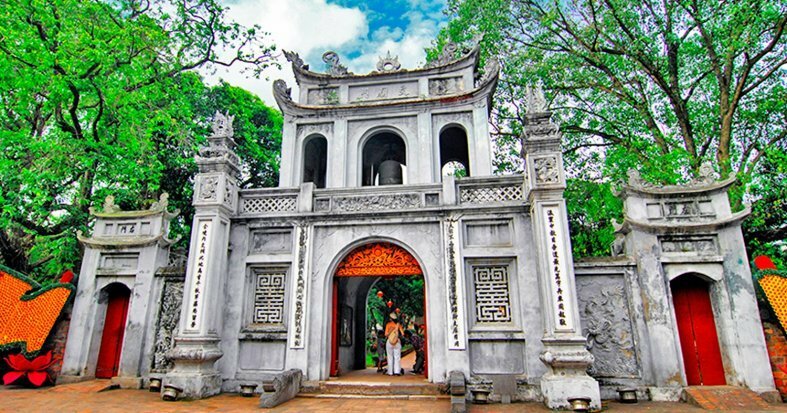 Start the day with a visit to Ho Chi Minh's Mausoleum, the complex dedicated to Ho Chi Minh and then the iconic One Pillar Pagoda, built on stilts. Next visit Tran Quoc Pagoda, Hanoi's oldest pagoda on the bank of West Lake and Temple of Literature, which was the first university of Vietnam. In the afternoon, take a cyclo ride around the streets of the Old Quarter which were named after the specifics goods once offered for sale there. Stop at Hoan Kiem Lake to learn about the legend of the lake and visit Ngoc Son Temple and enjoy a traditional Water Puppet Show. Overnight in Hanoi. Breakfast at the hotel. Depart by road to Ha Long Bay, a World Heritage area of outstanding natural beauty. 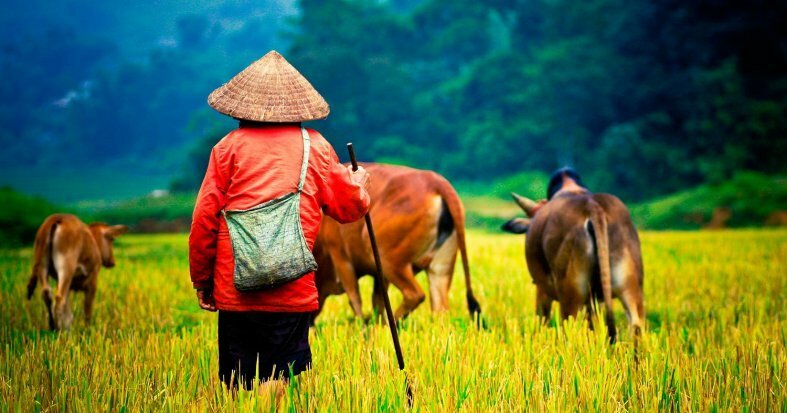 Travel through the rich farmlands of the delta and witness daily life of the Vietnamese villages. Arrive in Ha Long and board a traditional junk boat. Lunch on board. The cruise passes by many fascinating islets and may stop for a while to visit The Surprise Cave. Dinner and overnight on board. Brunch on board as the junk continues to cruise before you return to Ha Long port. Disembark and transfer to Hanoi and Noi Bai aiport for a flight to Danang. On arrival, you will be met by your guide and then transfer to your hotel. Overnight in Hoi An. Breakfast at the hotel. You can have a leisurely morning at the hotel or take a take a walk along the river. 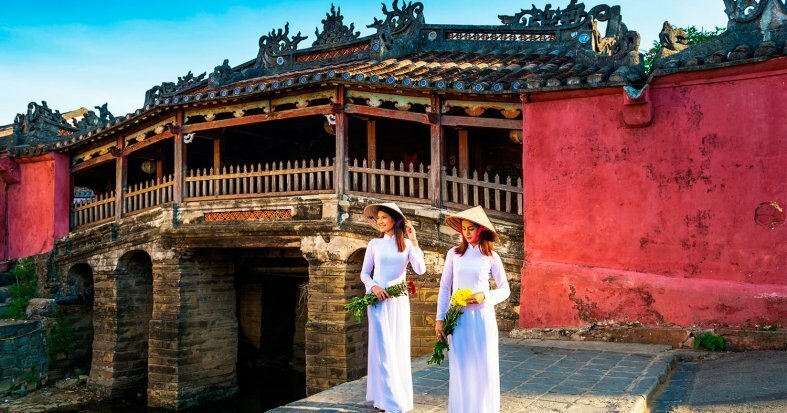 In the afternoon enjoy a guided walk around the tiny town of Hoi An with the stops at a 400-year-old Japanese Bridge, a 300-year-old Chinese Temple and 200-year-old Vietnamese former merchants' house. Overnight stay Hoi An. Breakfast at the hotel. You will be free in Hoi An until check out. In the afternoon you travel along one of Vietnam's most scenic highways to Hue. Stop on the way at the white sands of Lang Co Beach and at the top of Hain Van Pass for a panoramic photo opportunity. Arrive and transfer to your hotel in Hue. Overnight stay Hue. Breakfast at the hotel. Enjoy a full day tour and visit the impressive home of the Nguyen Dynasty emperors, the Imperial City and the Royal Citadel. Much of the Citadel was destroyed during the Tet Offensive but is gradually being restored. 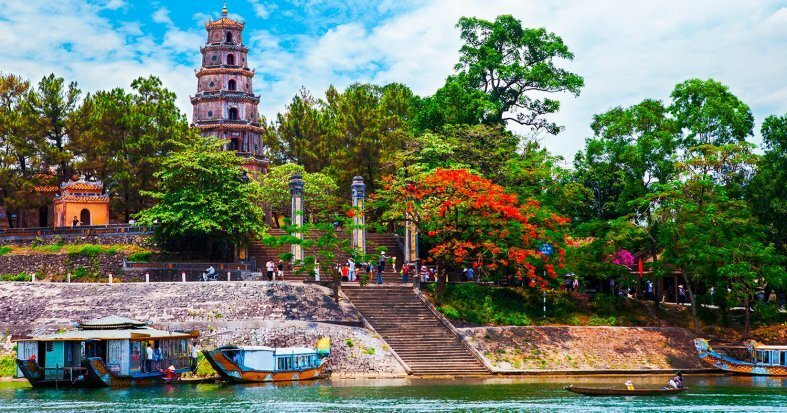 Continue by boat on Perfume River to the Thien Mu Pagoda, Hue’s oldest and most beautiful pagoda. 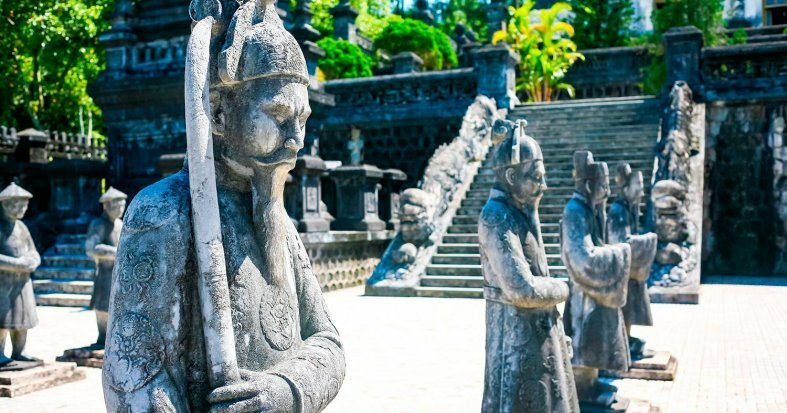 Discover the mysterious tombs of King Minh Mang and King Khai Dinh before you return to Hue. Overnight stay Hue. Breakfast at the hotel. Enjoy a free day in this exciting city. *We recommend an optional excursion to discover the magical Mekong Delta. Overnight stay in Ho Chi Minh City. * Optional excursion to the Mekong Delta: Depart to Ben Tre province crossing Rach Mieu bridge. On arrival in Hung Vuong Pier, hop on a motorized boat on the Ben Tre River, one of the tributes of Mekong River while witnessing the lively activities of local life along the way. Stop at a brick kiln and visit one of the many coconut processing workshops located along the canal. Take a motorized cart or bicycle along the shady paths and pass by green rice fields and vegetable plains to discover everyday life on the river. Take a rowing-boat along a beautiful water palm creek before you return to the pier. Price per person: £24,00. Breakfast at the hotel. The day is free at your leisure until being transferred to the airport for your overnight flight to the UK. Arrive back in the UK and end of your trip. Passport with a minimum of six months validity. No visa is required for stays of up to 30 days. In Thailand they drive on the left-hand side of the road. No visa is required to enter the country for stays of up to 15 days. 220 V in the majority of the country. Adapter required. There are no mandatory vaccinations for travellers from EU countries. Check with your GP. There is free wi-fi in the most popular tourist spots of the country. Passport with a minimum of six months validity and two passport sized photos. A visa is required. Issued on arrival in the country. Price approximately $35. Two passport photos are required for the application. For above flights 1 luggage 20kg is included per flight per person. Accommodation at the hotels is as indicated. In the event of any changes to accommodation, they will always be of the same, or a higher category. The category of hotels is not standardized across all countries in the world. For this reason, the criteria may differ depending on the destination country's own standards. Due to adverse weather conditions and/or for safety reasons, the order and duration of the excursions included in the itinerary are subject to changes and/or cancellations without notice. 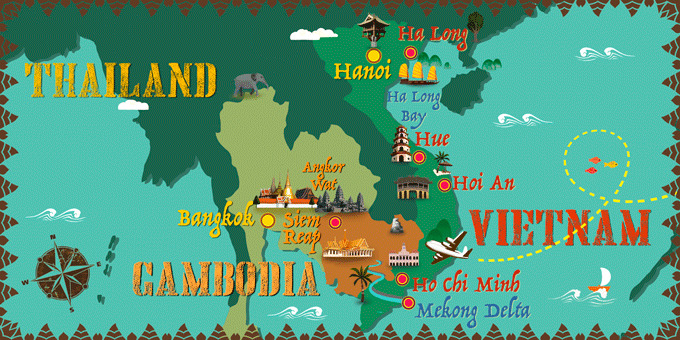 National flights: Bangkok - Siem Reap - Hanoi - Danang, Hue - Ho Chi Minh*. * Details of your internal flights will be detailed in your travel documentation, in your Private Area, nearer to your departure date. All internal flights are operated by Vietnam Airlines. ** Possibility of booking optional excursions in the next step of the booking. Please note that all additional optional excursions which are not selected at time of booking must be requested before final payment is made at least 60 days before departure. Breakfast at the hotel. Transfer to the airport for your flight to Siem Reap. Arrival in Siem Reap. Meet your guide and transfer to your hotel. Take the opportunity to explore this beautiful city and get to know your surroundings. Discover the exotic local cuisine and relax at your hotel. Overnight stay. Breakfast at the hotel. The day is free at your leisure until being transferred to the airport for your overnight flight back to the UK.